The WEST SYSTEM® Six10 cartridge is comprised of the cartridge body, removable nose plug and a threaded retaining nut. A 600 static mixer is included with the cartridge. (It’s called a static mixer because it has no moving parts.) 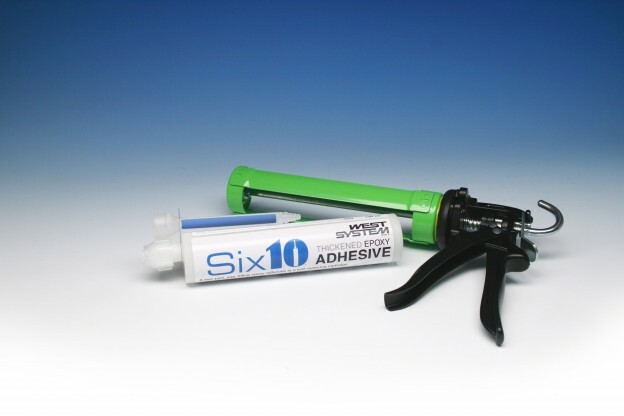 The cartridge fits into any standard caulk gun—manual, cordless or pneumatic—and allows simultaneous dispensing and mixing of the two-part epoxy. Manual caulking guns are graded by mechanical advantage (MA) in relation between the travel of the pistol grip and the plunger. When using he static mixer, resistance is increased. Low MA guns 3 to 8, which generally cost less, are adequate to dispense Six10 with the mixer at temperatures over 60°F. If it is cooler than that, you might want a gun rated MA 12 to 26. Minimum application temperature is 50°F. The WEST SYSTEM 600 Static Mixer blends the resin and hardener as it passes through the device. Often, you’ll apply some epoxy to your work surface and proceed with assembly. While you’re working, adhesive in the mixer will eventually begin to cure. You should have about 42 minutes at 70°F before you need to dispense more epoxy. If you need more time, here is a simple method to extend working time and prevent curing in the mixer, as well as loss of a static mixer. Cut a 1″ to 2″-diameter PVC pipe to about 6″ long. Install the PVC cap on one end of the pipe, then pass the pipe through a hole the same size as the pipe in a square of plywood. This will keep all upright. With the cap facing downward, >place this device in a cooler with a little ice in it. Place the cartridge with mixer attached in the tube. The cold temperature will double or triple the working time of the material in the mixer. The static mixer is a great tool that blends the resin and hardener thoroughly and automatically as it is dispensed. When you’re involved with a big gluing job you can use successive tubes, transferring the same static mixer from the emptied tube to the fresh one. But the mixer consumes a small percentage of the total amount of epoxy in a tube. If you’re doing a small job, it is good to know that you don’t have to use the static mixer. Simply squeeze out what you’ll need (maybe even a little less—you can always mix a little more if short) onto a piece of poster board or plywood and stir thoroughly. The resin and hardener are slightly different colors; use this color difference to gauge the thoroughness of your mix. All should be a consistent color with no streaks. The nose plug covers the two separate ports that emit resin and hardener and prevents leakage and contamination. Remove the plug before use and replace it afterward. As resin is emitted from one side and hardener from the other, the plug will get residue of resin and hardener on it. For best results, clean the tip before replacing the plug. Try using a stir stick, paper board or poster board with a slot cut into it. Use this to swipe over the divider. When you replace the plug be sure it is oriented the way it was when it was first removed, otherwise resin and hardener on the plug will contaminate opposite side of the port and cure. To prevent this, before you use the product remove the retaining nut and put one magic marker dot on one side of the removable plug and a corresponding dot on the same side of the cartridge. When replacing the plug, you’ll always be able to orient it properly. Replace the plug, aligning the dots as described earlier, then replace the threaded cap. The tube will be ready for use next time you need it. Always replace the retaining nut, as hydraulic pressure may force the plug out. Store the Six10 tubes away from sunlight in a cool, dry place. But don’t refrigerate them. On a boat, store the tubes in a plastic zip-lock bag so they stay dry. When properly stored, Six10 will remain useable for years.